The title may be a bit long, but its essence is very simple: we try to shorten learnt clauses. The basic idea was described in this post: there is a clause we just derived, e.g. i.e. clause (2), what we have been searching for! So, how could we do this kind of reasoning efficiently? It turns out that this is not so difficult. We simply need to try to propagate -f using only the 2-long clauses. Then, we will reach -g through the intermediary, a. The set of problems used were those of the SAT Competition 2009, and the time limit was 1500 seconds on some powerful machines — they are approx 2x as fast as those used in the competition. 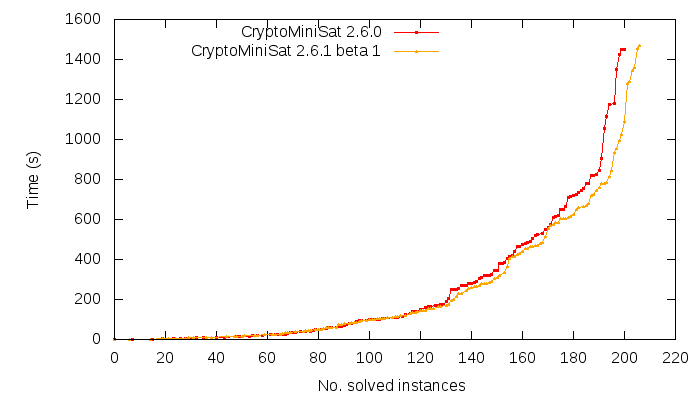 As you can see, transitive OTF self-subsuming resolution seems to pay off in terms of number of problem instances solved within a certain time limit. I have decided to add this feature to the upcoming CryptoMiniSat 2.6.1, which should be ready soon.